It’s not the kind of invitation that I get every day, but the note was quite clear on this singular requirement. We duly assembled in the GRP workshop on the appointed day last week with our blades, but it was for nothing more sinister than knots and splices training with a bit of whipping thrown in for good measure. As a lot of the elements of a wooden sailing boat that aren’t held together by nails are attached by bits of string, this is an important thing to know about. We warmed up with some splicing; a good way of finding out to find out how ropes are made by taking them to bits and putting them back together. We used 3 strand manila, which is a simple rope to work with when learning to splice. We made an eye splice, a back splice and an end-to-end splice. An eye splice is a way of making a strong and permanent loop in the end of a rope; it’s much stronger than a bowline: an eye splice has 80% of the strength of the rope whereas a bowline only has 45%. 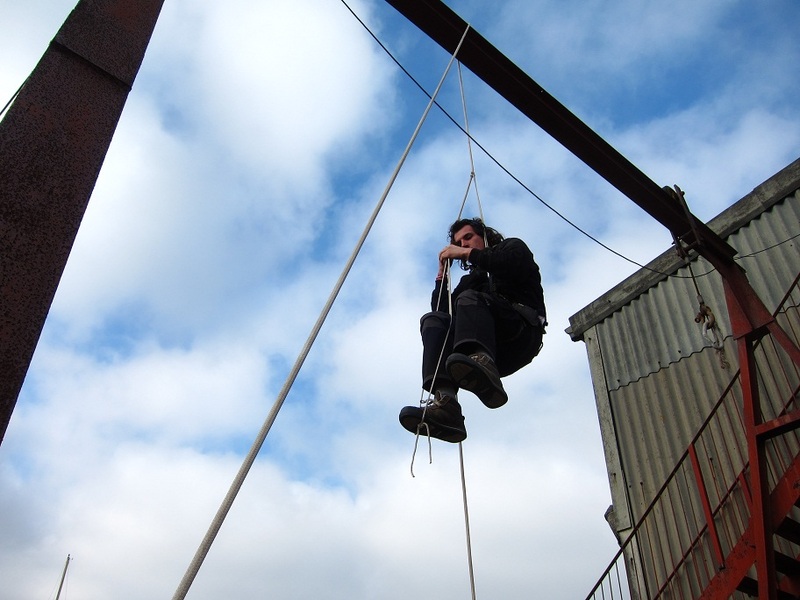 A back splice is a good way to tidy up the end of a rope and stop it from unlaying. An end-to-end splice is used to join ropes together. We also learned to make a deck quoit (properly known as a grommet, prompting a brief rendition of the class 111 theme tune). Whipping is a way to bind the components of a rope together to stop it from fraying or unravelling by wrapping them with thread. We looked a bit like a rather scruffy Mother’s Union sewing circle as we sat there with our needles and palms threading whipping twine and chatting about rope lore and philosophy. 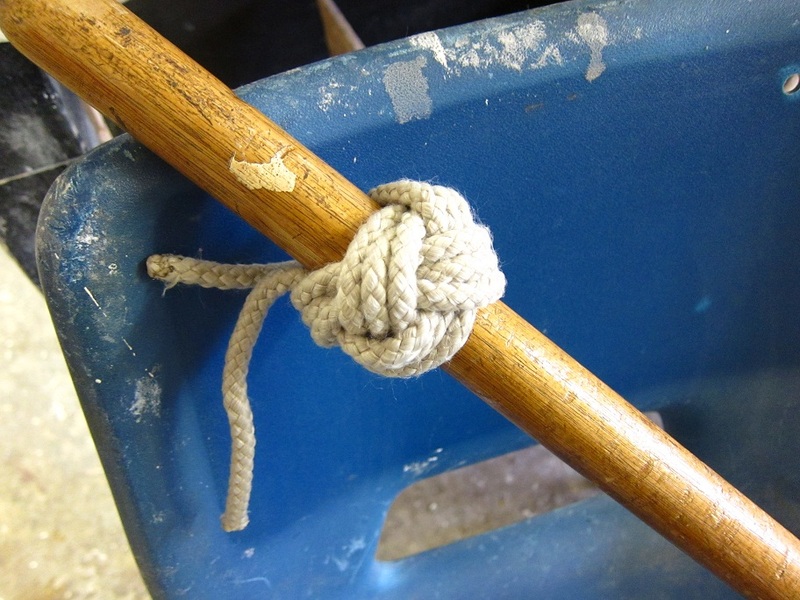 The pros and cons (mainly cons) of the effectiveness of the thief knot in preventing maritime crime was considered, and the alternatives to being skilled at knots: ‘if you can’t tie knots tie lots’. Knot literature was also discussed; Des Pawson’s seminal work on the subject was highly recommended, giving instruction on making everything from a Portuguese sennit to a cat-o’-nine tails. Des also has the distinction of looking as if he’s made of string. The next day we got to test out our knot tying skills to the limit. After a warm up on various bends (knots that join ropes together) and hitches (temporary knots), in true IBTC style we put our skills to immediate practical use by using rolling hitches to climb the boat gantry on the hard at the back of the boat shed and not killing ourselves. Braid-on-braid is a 100% polyester rope that is the most popular type of rope for halyards (used to pull things up and down on boats) and sheets (used to trim and set sails). It’s a bit more complicated to work with than 3 strand, but having survived the gantry climb, we were up for the challenge. We put an eye in braid-on-braid, which was a bit like performing an intestine operation and splicing braid-on-braid to wire, which is just plain fiendish. Another thoroughly enjoyable and informative course presented by Rob; it’s becoming a habit.